Kahle joined the military after just one year in college and at first was stationed in Montomery, Alabama. Later, he moved to the northeast, but he was ultimately deployed to Japan, and then on to Korea when the conflict broke out. While there he worked as a mail deliverer. During his speech at the ceremony on Concord's campus, Kahle remembered how much he enjoyed the people there, wishing he could return for a visit. 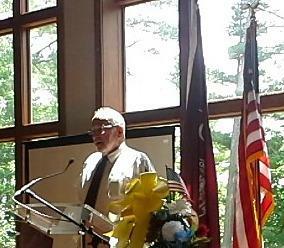 While Kahle spoke about the world of 50 years ago, he also addressed current conflicts. For him, the world has changed tremendously and he said he relies on his Christian beliefs to guide his view. "We’re still in wars, and wars, well, if you’re a reader of scriptures, they’re always going to happen, there’s always going to be wars," Kahle says. "And rumors of war...I can’t hardly imagine how it is." The ceremony wrapped with a video tribute to the Korean war.